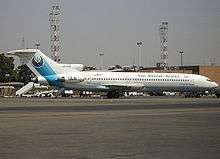 Iran Aseman Airlines or Aseman (Persian: هواپیمایی آسمان‎‎) is an airline based in Tehran, Iran, operating scheduled domestic and international flights, as well as charter and air taxi services. According to an aviation website, the airline's historic links go back to 1958 to the airline Air Taxi Co., which became Pars Air in the 1970s and later Iran Aseman Airlines. Aseman was the first aviation company in the Middle East to provide Air Ambulance services. On 12 October 1994, Iran Aseman Airlines Flight 746, a Fokker F28 Fellowship (registered EP-PAV) en route from Isfahan to Tehran suffered a sudden loss of power in both engines at 23:05 local time, 35 minutes after take-off from Isfahan International Airport. The aircraft went into an uncontrolled descent and crashed near Natanz, killing all 59 passengers and 7 crew members on board. ↑ "Plane Skids off Runway in Northwestern Iran". Fars News Agency. Retrieved 27 August 2010. Wikimedia Commons has media related to Iran Aseman.